Very flat and typically not over 40 MPH. We are in West TN so not much elevation change. 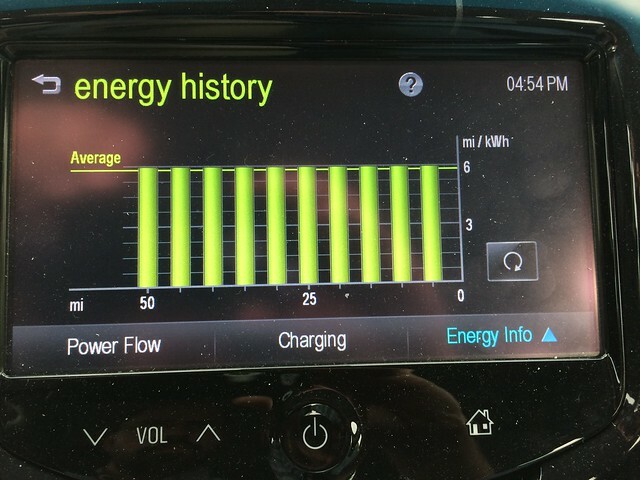 Does anyone know if the energy history gauge goes above 6 mi/kWh? Topic: Drive home 100 mile legs... How slow to drive? Re: Drive home 100 mile legs... How slow to drive? Topic: New Owner! Just got a 2015 Spark EV w/ 26000! Re: New Owner! Just got a 2015 Spark EV w/ 26000! I I can not answer your question but I know the Spark EV has an electrical component under the driver seat that sticks up a little bit and it is not on the ICE version. Hopefully the bracket will clear it. I'm interested to hear what you find out. I don't tend to drive in L but I do shift into L when I need to slow down for a stop light or anytime I need to slow down quickly.